When most people think about making a residential move, they instantly get the image of having to rent a great big truck that they aren’t comfortable driving, pack up all their things and hope that everything makes it to the new house without breaking. Moving is a big job, even if you are just moving within the same city. In fact, some people will tell you that in their experience, a local move can be even more stressful than a cross country move. It is very common to underestimate all of the work that needs to be done with residential moving and storage. From purchasing all of the packing supplies and services that you will need, to making sure that everything is packed and stacked properly, it can be very overwhelming. While not everyone has a million dollar collection of artwork to protect, we all have things of value that we want to keep safe during a residential move. Household moves in Rhode Island should include the use of all packing supplies and services that are designed to protect your belongings. From flat panel televisions to grandmother’s china tea set, it is important to know that everything will be safe when you move from one home to another. Make sure to contract with Rhode Island residential movers who are insured, that work with you to make sure they understand what things are breakable and have the proper packing materials to protect fragile or expensive items. Conlon Moving & Storage specializes in finding safe solutions for our residential clients, whether you need to move the family piano, valuable antiques or a ceramic bear collection, our team can provide you with all of the services required to ensure that everything gets there safely. We also have special boxes and packaging for electronic and computer equipment, flat panel televisions, stereo systems and more. While you could pack many of these things yourself, chances are you don’t have the years of experience, training and insight that a team of professional movers can provide. If you have never done a complete residential move with a household of stuff, you have no idea what you are getting yourself into. Most people purchase a new home and move in from an apartment or condo, bringing a few items and personal belongings with them. Building a family means collecting more furniture and things, so over the years, the sheer volume of stuff begins to grow and before you know it, the house is filled to the brim with things that you might not be able to pack and move on your own. Household moves in Rhode Island can be challenging, especially if you don’t have a lot of experience doing them. It pays to hire professional residential moving and storage companies to do it for you. Some homeowners think that loading the boxes and furniture onto the truck and driving the truck from Point A to Point B is the hardest part of a move. While that can be back-breaking work and a little tricky if you don’t have a lot of truck driving experience, the worst part of it all is the packing. 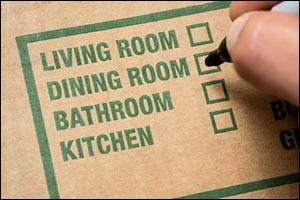 Think about going through every single room and storage area of your home and packing it all up in boxes. Wrapping glass and fragile items, labeling the boxes so they get to the right place at the new destination or separating out storage items that need to be put away on a temporary or full time basis. Just the thought of handling every single thing inside your home can be exhausting. It pays to hire professional Rhode Island residential movers to take care of all those messy, dusty and frustrating details for you so you can focus on preparing to live in your new home. Let’s face it, not every move is going to be for positive reasons. People do make moves because of job promotions or finally being able to afford their dream home, but people also make moves because of losing a job, downsizing after the kids move out, suffering a foreclosure and the loss of a loved one. Moving itself, even in the most positive of situations, can be a stressful experience. Studies have even been done that prove that moving can be just as stressful as other stressful situations, like starting a new job, moving in with someone or suffering a loss. Think about all the things that are changing and all the adjustments that have to be made. Pile on top of that the natural stress that comes from having to sort through and pack all of your things, and you have a recipe for a mini breakdown. When you hire a professional company to take care of household moves in Rhode Island, a major part of that stress gets taken care of for you. Residential moving and storage should include packing supplies and services for specialty items for a truly “full service” household move. Knowing that someone else is taking care of the bulk of the work so all you have to do is focus on the details, can give you a peace of mind that you might not have ever experienced during a residential move. You can even hire Conlon Moving & Storage to unpack your things for you and get everything set up at the new location. This can relieve a lot of anxiety and stress that many people have about making a household move. If you are planning a residential move in the South Coast area, contact Conlon Moving & Storage. We can help you plan, pack and execute household moves in Rhode Island, anywhere in the New England area and around the globe. Local, interstate and international residential moves are no problem for the team of highly trained, experienced movers at Conlon Moving & Storage. Call today at 508-336-7766 for a free estimate on your next move!